(PhysOrg.com) -- The World Cup is gaining the most attention at the moment from soccer fans around the globe, but next week RoboCup, the annual world championship for soccer robots, gets underway in Singapore. RoboCup’s goal is to develop autonomous humanoid soccer-playing robots capable of beating the best human players playing under FIFA rules by 2050, and American researchers think their new robots will take that aim a step closer. 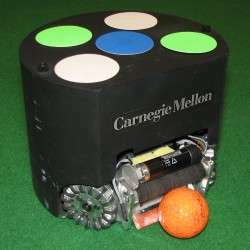 The American robots, developed at the Computer Science Department of Carnegie Mellon University in Pittsburgh, use a new physics-based algorithm that takes into account ball dynamics, and enables the robots to calculate where the ball is most likely to go next instead of simply reacting to the ball or following the US team’s previous strategy of using pre-programmed plays (similar to a strategy in American football). Stefan Zickler, who wrote his PhD thesis on the algorithm, said previous robots could not tell when they would lose control of the ball when carrying out maneuvers such as dribbling, but the new algorithm helps them make such predictions, and this gives them a distinct advantage over robots without the algorithm. Physics-Based Motion Planning for Robot Soccer Dribbling. Zickler and colleagues tested an earlier version of the algorithm at last year’s RoboCup, and their robots were highly successful until the quarter finals, when a disastrous glitch left the robots blind and dashed their hopes of a win. Professor of Computer Science, Manuela Veloso, believes this year’s team of five miniature robots, CMDragons, will be more successful, telling the Pittsburgh Post-Gazette she doesn’t “see any reason why we won’t win”. Physics-Based Motion Planning with Tactical Models. This video shows simulated physics-based motion planning examples in several challenging domains, including robot minigolf, robot soccer, and pool. The mini-robots are under the control of a computer watching the action via camera above the playing field. Without the physics algorithm the computer tries to position the robots on the ball but does not make any predictions of the ball’s movement. With the algorithm this weakness is addressed, and the robots can now be moved into a position where the ball is predicted to go, which improves the skills required. The computer is able to make up to 60 decisions per second. Carnegie Mellon will also enter a team of humanoid robots in the Standard Platform League. The humanoids walk on two feet and can speak and use landmarks to determine their positions. The robots can also be used for other games such as mini-golf (video below), but soccer is the game of choice because of the constant changes in the environment and because of the cooperation required between players. The algorithm could also have a more practical use in helping robots fight fires, taking into account factors such as the type of trees and the effects of the wind. RoboCup, which has been running since 1997, is the largest robotics and artificial intelligence event in the world attracting competing teams from countries such as the US, Brazil, Japan, and Iran. This video shows a goal scored by our team CMDragons at RoboCup 2009. The attacking robot uses a novel dribbling behavior which employs randomized, physics-based motion planning to make tactically sound navigation decisions while remaining in full dynamic control of the ball. This video shows an autonomous robot minigolf system that uses physics-based motion planning to automatically devise control solutions for never-before-encountered problems. Planning and control is performed by an off-board computer with a global dual-camera overhead vision system.